Geology, Tectonics, and Deep Structure of China. - Characteristics and Mechanisms of Chinese Continental Tectonics. - Plate Tectonics of China. - The collision between the Indian subcontinent and the Eurasian continent. - Seismic Tomography Imaging of China Deep Structure. China is located in one of the most complicated tectonic areas in the world. Three Precambrian cratons (Sino-Korean, Tarim, Yangtze-Cathaysian) and the intervening Paleozoic accretionary and collisional folded belts (The Huanan Caledonides, Ogchean belt, The Tan-Lu fault, Honam fault) constitute the tectonic backbone of China. Rocks formed during the Archean (4.6–2.5 Ga) and Paleoproterozoic (2.5–1.8 Ga) occur mainly in the lower crust, and their outcrops form between 5% and 8% of the surface area of the Chinese continent. Five tectonic periods can be distinguished in the tectonic evolution of Chinese continent during the Meso-Neoproterozoic and Early Cambrian. Major collision and amalgamation of continental fragments occurred in the Chinese continent during the Indosinian Tectonic Period (260–200 Ma). Collision zones were formed during this period. More than three quarters of the Chinese continental area became amalgamated to the Pangean Super Continent in the areas to the north and east of the Bangongco-Nujiang zone. 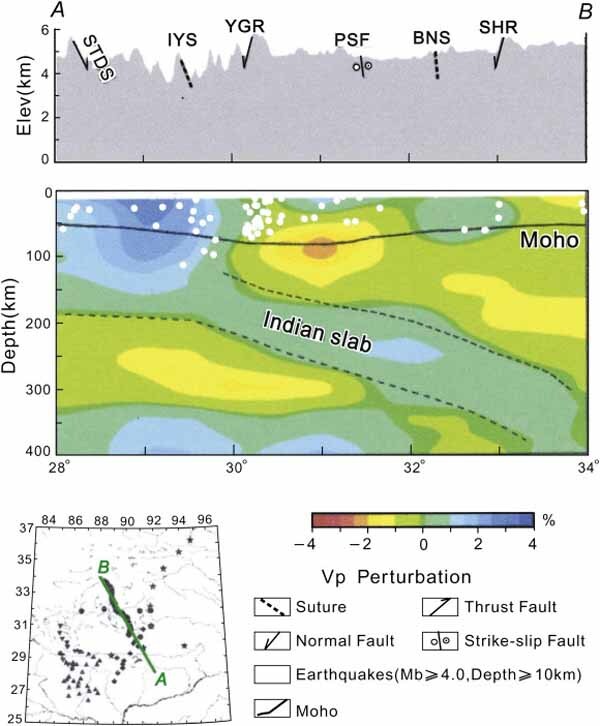 At the same time, widespread intraplate folding and faulting developed in the Indosinian Tectonic System affecting the sedimentary cover over a large part of the Chinese continent. In the early Mesozoic the Himalayan and adjacent continental blocks were attached to Gondwana. Subsequently these blocks were separated from Gondwana and moved gradually northwards until they converged and collided with the southern margin of Eurasia in the Banggongco—Nujiang and Yarlung Zangbo Collision Zones. The collision zones, which resulted in the Himalayan Tectonic Zone and the Himalayan Mountains, did not form until the Neogene. The main period for the formation of the present landforms of the Chinese continent mainly formed in the Miocene-Early Pleistocene (“Neotectonic Period”). 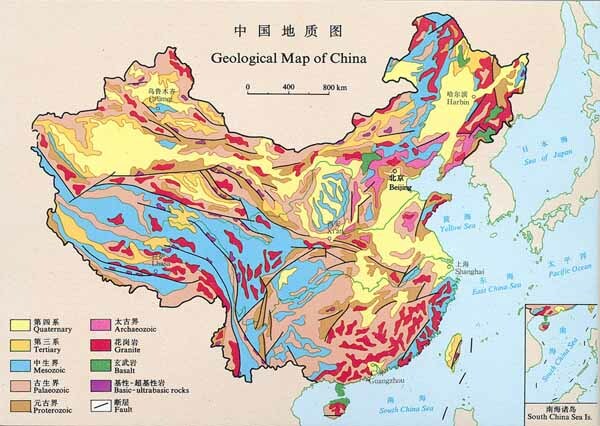 Geological Map of China from the China Geological Survey. The geological structure of China is divided into several parts. The center of China is on the loess plateau - the world's largest Quaternary loess deposit. The alluvial East China plain extends from just south of Beijing in the north, to the Yangzi river delta in the south, punctuated only by the igneous Shandong highlands and peninsula. South of the Yangzi river, most of the landscape is mountainous, dominated by sedimentary deposits and by the Yangzi craton. The most famous scenery in China is found in the karst landscapes of Guangxi and Yunnan provinces. The alluvial Sichuan basin is surrounded by mountains, the Qinling mountains to the north and the Himalaya to the west and southwest. Much of Northeast China, or Manchuria, is dominated by alluvial plains, but the border regions with Korea are also highly mountainous. In the west, most of the Tibetan plateau is in China, and averages over 4000 meters in elevation. The Yunnan-Guizhou plateau is also an extension of the Tibetan plateau. There are hundreds of sedimentary basins in China. The Mesozoic-Cenozoic sedimentary basins with terrestrial facies source rocks provide 95% of the current crude oil production in China. Paleozoic marine facies source rocks are proved existing in Tarim basin and in the southeastern provinces. Simplified map of major geological units in continental China and their relative motion (mm/yr) with respect to stable Siberia, based on Quaternary fault-slip rates and other neotectonic data (after Ma, 1989; Deng et al., 2002). Thin lines are active faults. 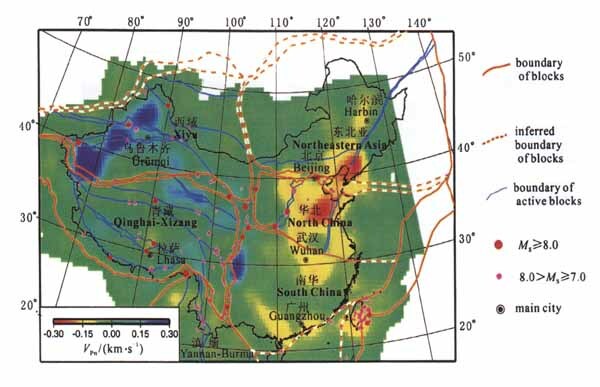 WG—Weihe graben; SG—Shanxi graben; YR—Yinchuan rift; HR—Hetao rift; BB—Bohai Basin. Characteristics and Mechanisms of Chinese Continental Tectonics. 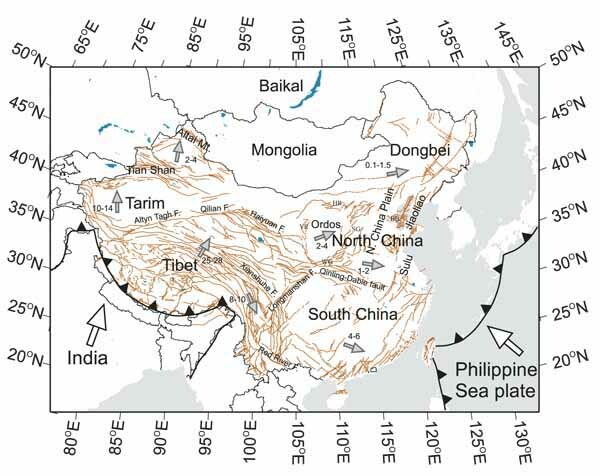 The intraplate deformation is the most important characteristic in China tectonics. The Chinese continent forms part of the Eurasian continental plate, this plate appears to be a coherent and unified lithospheric plate. The large areas of the Chinese continent have been affected by intense folding, thrusting, with variously orientated linear and foliar structures and widespread magmatism and metamorphism. The deformation has been described as polycyclic. The tectonic activity has included the formation of geodepressions, the activation of platforms, the activation of para-platforms and platform margins, the formation of platformal fold belts and intraplate or intra-continental orogenic zones. The global tectonic mechanisms control the movements of the lithosphere plates, the dynamic mechanisms which have affected the Chinese continental plate, and the evolution of Chinese continent. 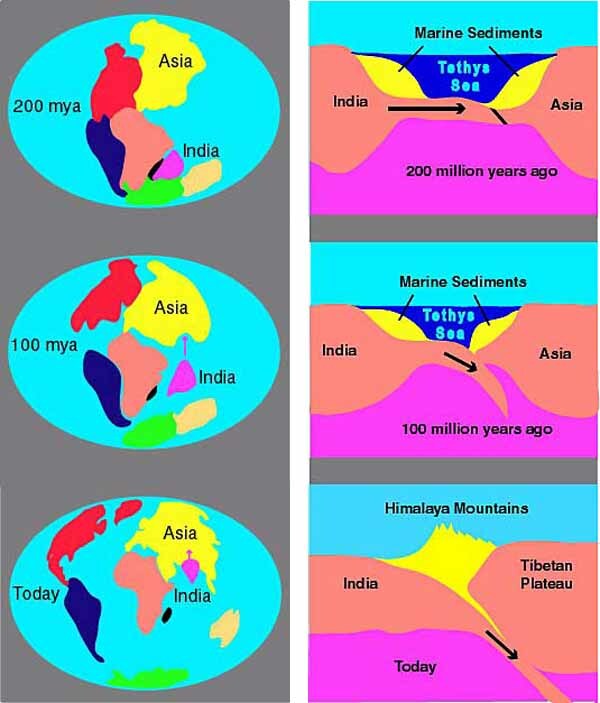 The Paleogene collision of Indian to the Eurasian created the Himalayas and Tibet Plateau. Some orogens in the northwestern part of China such as the Central Tianshan and Arjin Mts. are actually huge fault zones rejuvenated by the collision. The faulted slices and blocks which make up the fault zones are actually components of the surrounding tectonic units the fault ever cut through. The collision between the Indian subcontinent and the Eurasian continent. India has penetrated over 1500 km into Asia. The collision between the Indian subcontinent and the Eurasian continent continues today, produced the Himalaya and the Tibetan Plateau. The plate carrying India separated from Antarctica nearly 200 million years ago. India then moved north, closing the Tethys Sea, and about 55 million years ago (in Paleogene time) it began to collide with Asia at the rate of about five centimeters per year. As the strong Indian continental crust subducts beneath the relatively weak Tibetan crust, it pushes up the Himalayan Mountains. The Indian plate is thick and has low density for it to be subducted beneath the Asian plate. The result is a collision, causing sea floor sediments to be pushed up about 8-9 km, uplifting the Tibetan Plateau to an average elevation of over 4 – 5 km, and hundreds of km of displacement of crustal rocks to the east and southeast. Seismic Tomography Imaging of China Deep Structure. For a long time, the study of tectonics was based purely on geological data, restricted to research into the upper crust—the sedimentary cover and its crystalline basement. In recent years, more attention has been paid to the structure of the lithosphere, using geophysical methods. The structure of the of Earth’s mantle are studied by Seismic Tomography Imaging Technology. The late Mesozoic and Cenozoic significant thermal-structural events in the eastern part of China, i.e., magmatism, compressive and then extension tectonism, might be relevant to some depth-seated unknown mechanism. The Indo–Asian continental collision is known to have had a great impact on crustal deformation in south-central Asia, but its effects on the sublithospheric mantle remain uncertain. Studies of seismic anisotropy and volcanism have suggested that the collision may have driven significant lateral mantle flow under the Asian continent, similar to the observed lateral extrusion of Asian crustal blocks. Seismic tomography shows low-velocity structures in the upper mantle under the North China block. In general,Pn velocity in tectonically stable region like cratonic platform tends to be high, while that in tectonically active region tends to be low. The regions in compressive setting usually show higher Pn velocity, while extensional basins or grabens generally display lower one. Anisotropy of Pn velocity is seen in some regions. In the southeastern region of Qingzang Plateau the directions of fastest Pn velocity show a rotation pattern, which may be related to southeastward escape of the plateau material due to the collision and compression of Indian Plate to Asia along Himalaya arc. Notable anisotropy also exists around Bohai Bay region, likely indicating crustal extending and possible magma activity therein. Pn velocity lateral variation, active tectonic blocks and strong earthquake epicenters. It was derived the three-dimensional mantle structure under China and surrounding regions using P-wave travel time tomography. The inversion used P-wave arrival times from 745 Chinese seismic stations and the global data set from the International Seismological Center. The rays were selected from 3712 local events and 4623 teleseismic events from year 1978 to 1995. A total of 217,569 rays was used in the study. 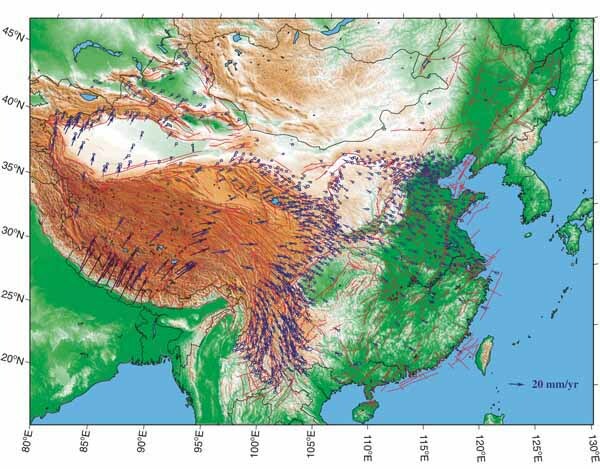 P-wave travel time seismic tomography of China and the surrounding regions. (a) P-wave velocity perturbation at 110 kmdepth. The solid white lines show the directions and dimensions of the two vertical sections in (c) and (d). (b) P-wave velocity perturbation at 220 km depth. (c)A vertical section of the P-wave vel velocity structure across northern China (line 1 in (a)). (d) A vertical section of the P-wave velocity structure across southern China (line 2 in (a)). 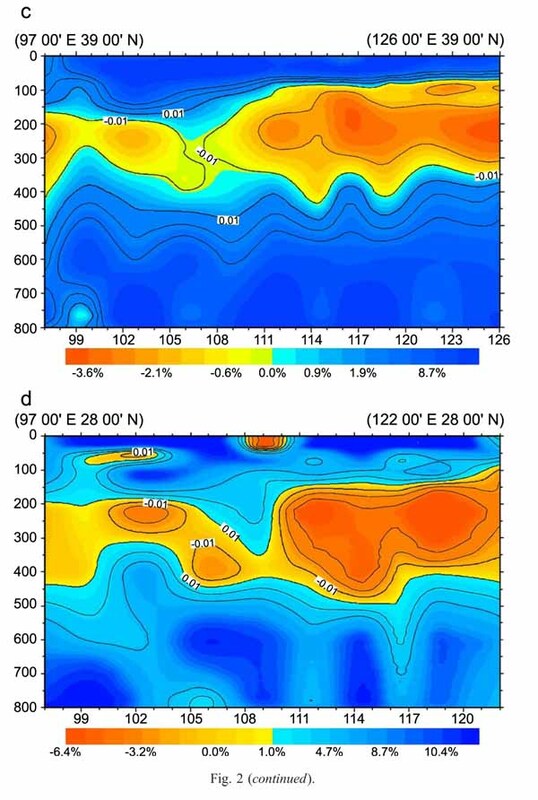 The P-wave tomography shows continuous low-velocity asthenospheric mantle structures extending from the Tibetan plateau to eastern China, consistent with the notion of a collision-driven lateral mantle extrusion. Numerical simulations suggest that, at the presence of a low-viscosity asthenosphere, continued mass injection under the Indo–Asian collision zone over the past ~50 My could have driven significant lateral extrusion of the asthenospheric mantle, leading to diffuse asthenospheric upwelling, rifting, and widespread Cenozoic volcanism in eastern China. Vertical cross-section of P-wave tomography under the Tibetan Plateau along a profile shown on the insert map (He et al., 2010). Red and blue colors denote slow and fast velocities, respectively. The velocity perturbation scale is shown at the bottom. The surface topography is shown above the cross section (Zhao, D. and L. Liu, 2010). Two low velocity zones are visible in the crust and mantle wedge above the subducting Indian slab, which may represent high-temperature anomalies or partial melts associated with corner flow and slab dehydration processes, similar to the formation of arc magmas, although the slab is a subducting continental plate. In the Tibetan Plateau, there are no prominent volcanoes, but geothermal anomalies exist extensively. Because dehydration of the subducting continental plate may not be as much as that of the subducting oceanic plate, and because the crust is so thick in Tibet, melts in the uppermantle wedge cannot reach the surface easily - hence, active volcanoes are not present in the Tibetan Plateau.